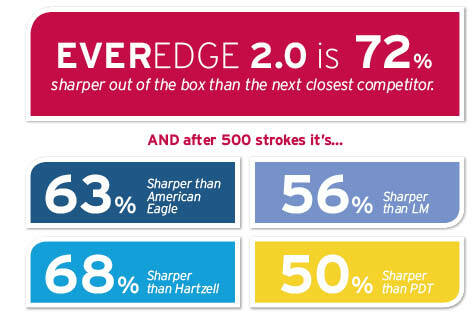 EverEdge scalers are sharp…EverEdge 2.0 scalers are even sharper. Using an enhanced finishing process, Hu-Friedy’s professional artisans are creating edges that are scientifically measured to be over 60% sharper than the next closest competitor. 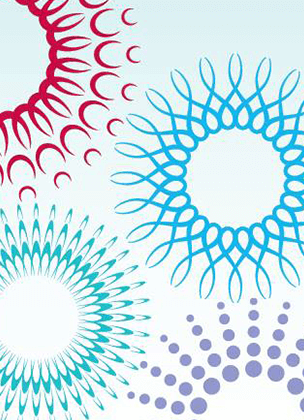 Less force means easier, more comfortable scaling for the clinician and patient. EverEdge 2.0 uses a new, optimized heat control process in order to maintain the hard, sharp edge. This heat control, plus several manufacturing intricacies in Hu-Friedy’s proprietary process, provide the durability needed for effective procedures and continued use. Hu-Friedy has invested in a custom blade evaluation system to ensure clinicians are receiving the sharpest possible instruments. Blades from every batch of EverEdge 2.0 are tested right off the factory line to confirm that the sharpness value remains in our target range, averaging 5 newtons of force required to cut the test material. Since the special characteristics of EverEdge 2.0 scalers are present throughout the entire blade, you are able to sharpen them at any point to extend their useful life while maintaining the integrity of the metal. If you don’t want to sharpen, dispose of the instrument through Environdent and use a new scaler. Either way, the choice is yours. Celebrating Dental Hygiene every day with new hygiene-purple grips! The colored grips also allow for easy identification of the EverEdge 2.0 scalers in each set-up. The same EverEdge handle you love! The unique diamond knurl pattern on the large diameter handle provides a confident and comfortable grasp. The #9 EverEdge handle was also designed to be the optimal weight for reduced hand fatigue. All EverEdge 2.0 scaler patterns available can also be ordered with a Resin 8 Colors handle. These lightweight resin handles use a color-coded system to easily identify scalers & curettes that correspond to areas of the mouth. Independent testing was conducted by CATRA, a specialized blade laboratory. 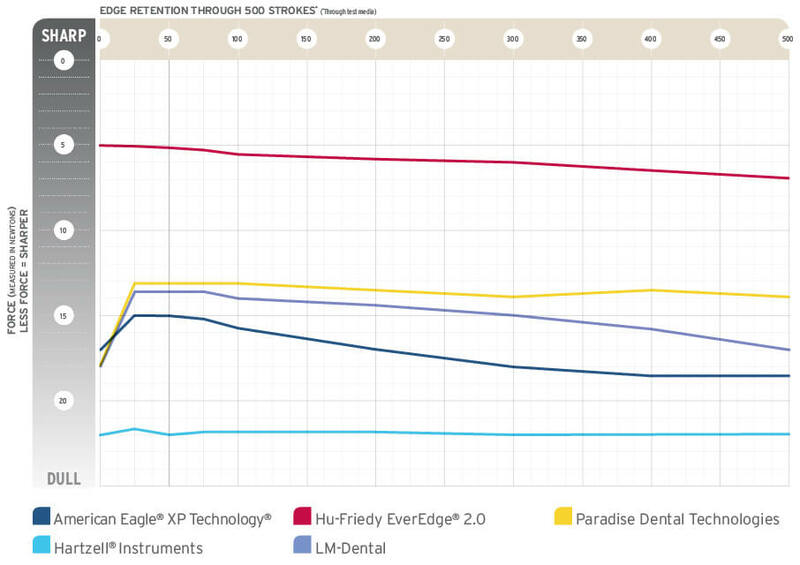 They evaluated Hu-Friedy EverEdge scalers alongside four competitors’ instruments. HOW WERE THE INSTRUMENTS TESTED? The blade of each instrument was tested by repeatedly pushing it into a specially calibrated silicone test strip. The amount of force required to push the blade into the test media was measured in Newtons, a common international unit used to measure tension and shear force. The less force required to penetrate the media indicates a sharper blade. The blades of each instrument were also subjected to multiple strokes on the same calibrated test strip to simulate wear. These repeated strokes will begin to reduce the sharpness of the blade and therefore require more force to enter the test strip. After a predetermined amount of strokes is applied, the force to make the final cut is measured to determine the sharpness durability of the blade. WHY DO SOME INSTRUMENTS GET SHARPER AFTER SEVERAL USES? When there is a spike in sharpness, that is due to the burr formation on the product. A burr is a small flap of metal that actually covers the instrument’s blade. Burr formations occur when the finishing step is done too quickly — an indication of poor process control. EverEdge 2.0 scalers do not have a burr formation due to our refined process and techniques.